I began to notice Kennedy's seizure activity increasing about two weeks ago. Brian and I began to monitor them to ensure they were not getting out of control. They were becoming more prevalent and were beginning to wake her from a dead sleep. I called the Neurology Dept. on Tuesday, and after three subsequent phone calls, I finally got a call back on Thursday (Thank god it wasn't an emergency)! The nurse informed me that Dr. Michelson wanted to switch up her meds - which was no surprise to me. I swear sometimes I think if all else fails they just add another medication. We were going to stop taking the Trileptal and Keppra and gradually begin Kennedy on Lamictal. I was given the same old statement "We will just have to keep trying different meds until one works"! Sometimes it would just be nice if something worked the first time around. She loves being a Medical Mystery! As I was reviewing the medication schedule with the nurse I was happily suprised to be informed that Dr. Michelson is recommending Kennedy to be on a Ketogenic Diet. This is a diet that mimics Atkins - It is very high in fat and low in carbs. It makes your body burn fat instead of carbs. Normally your body takes the carbs and converts them to glucose which travels through the body and is fuel for your brian. With this Ketoginic Diet your body is tricked into thinking you are starving thus forcing your liver to burn its stored fats. The liver converts these fats into Ketones which travel to your brain and replace the glucose. The brain then uses the Ketones for energy creating a Ketosis state. From this state your body creates it's OWN anticonvulsant which is said to treat Refractory Seizures (seizures not easily treated with medication). Dr. Michelson will present Kennedy's case and hopefully the team will accept Kennedy for this treatment. It will require a week hospital stay but it could have profound effects. We begun our new medication on Friday at a very low dose. We are currently taking 5 mg 2 times a day and we need to be at 25 mg 2 times a day. As expected Kennedy is having some pretty bad withdrawals; sweating, fussiness, crying, irritability....As of Tuesday, she is finally coming back into her own - Thank God! The medication seems to be working so far. Her seizures are not as severe - so hopefully as we keep increasing the medication dosage each week the episodes will dissipate. Well I have decided to make the big move…..With a heavy heart I will be saying good bye to Park West. My new job will be Kennedy’s full time caregiver and advocate. My life has been like a circus act since coming back to work and juggling the special needs of Kennedy….this “act” has finally posed too much for me to handle. I am stretching myself way to thin and I needed to make a change. I have been getting this gut feeling (which I don’t often get) that I needed to alter my life plans drastically and be home with Kennedy as her full time caregiver. With the uncertain future for Kennedy I just didn’t want to miss another day with her. The diesel company next store to Park West has a marquee below their company sign – each month they put up a new quote for all to see while driving up and down Peck Road . My Ah Ha moment was reading the quote of the month, “Lost time is never found again”. So that’s it….God is leading me to be home with my daughter, so that’s what I am going to do. I have another calling in life…to spread understanding and awareness to the world regarding the life of having a special needs child. I know when we first begun this journey on August 13th I was starving for information and to find families going through what we were going through – if Kennedy’s story could help families out in similar situations to ours and let them know they are not alone, then my job is done. Life is going to be rough “financially” but we will figure it out – we always do. Thank you for all your love, support, and prayers J I tell Kennedy every night what a lucky girl she is – most people have never even met her, however, she is in their thoughts and prayers every day. Well I have had numerous people write to me and tell me that I am there hero. To hear somebody direct a statement like that in my direction just astounds me! So this evening I sat down and really thought what the word "hero" means to me. Webster defines a hero as, "a mythological or legendary figure, often of divine ancestry, who is favored by the gods, endowed with great courage and strength, and celebrated for his bold exploits." To me, a hero isn't someone that is fictional or that was raised in nobility. A hero doesn't have to be someone considered better then anyone else. A hero is someone who has done something that she is looked upon for. Someone who does something great....not because she felt she would be praised for it, but because she knew it was the right thing to do. I to know a real hero. Her name is SHANNON CECIL! For those of you who don't know Shannon she is a smart, beautiful, crafty, caring, loving, giving, obsessive compulsive, organized, charming, fun loving person....Whenever you are in her presence she has this glow about her and makes you feel right at home. She is always upbeat and walks with her head held high. She makes you want to be a better person and her smile is contagious. She has that zest for life that I think some of us have lost. Hi everyone! Let me start this by saying God is Good!!! The hunt takes place from 9:00am-11:00am on Saturday morning at Central Park . If you can help me out in any way, please let me know right now, email or call me. I am going to call Crispy Creme Doughnuts and see if they will donate some doughnuts and/or give us a discount on those, does someone want to take up this job? What do you think? Can you help, Kennedy really needs your support! I just want you to know that I had nothing to do with this. This opportunity has been GIVEN to us by God himself. Prayers are being answered right here ladies. Our Lord loves this family and wants us to help him bring them closer to Him. Lets show them how God works in their lives! The bake sale was a success - Thanks to Shannon we raised over $1,700 for Kennedy! It was so awesome to see so many people come together for a common cause - people that have never even met me or my family took time out of their lives and away from their families just for us. When I saw the turnout on Saturday it brought tears to my face. To see all the hard work that was put into this event in such a short amount of time had me in awhhh. I am so thankful to have people like this in my life. I feel that since Kennedy has been born all the people that have come into my life have turly made me a better person. I feel so privileged and honored to call Shannon Cecil my friend and Hero!!! Since we found out this horrible news about Kennedy's Degenerative Neurological Disorder Brian and I decided we need to get Kennedy out and about as much as possible. Kennedy went to Disneyland for the very first time last Friday. She loved it....we rode on the Jungle Cruise, Winnie the Pooh (which she loved b/c all the bright lights), Snow White (which she slept through), The Haunted Mansion, & Buzz Lightyear Master Blasters (which was her favorite). We went with my Mom and Dad, my cousin Alex and her friend Shay, my friend Brindle and her daughter Sophie. We had a blast - I can't wait to take her to California Adventure Next. On Thursday night after Kennedy and I had dinner @ CPK with Jen and Brandon I got a phone call from my friend Melissa saying that they had a Suite @ The Citizens Business Arena for Disney on Ice and she asked if we wanted them for Kennedy. Of course I want to take Kennedy!!! I was so excited I could not wait to take her :) I called a couple of my girlfriends with kids and asked them to join me. We had such a good time. Kennedy was not to sure of the show during the first half....I think the noise kinda bothered her. However, during the intermission Kennedy settled down and loved the second half. She loved all the lights and noise. A couple of weeks ago Brian bought us tickets to take Kennedy to her very first Angels Game. It was a big family affair.....we went with Kennedy's Uncle Greg, Uncle Chris, Uncle Chris' girlfriend & cousin Josh. We had great seats in the left field pavilion. Kennedy was all decked out in her Angels gear and she had such a great time. However, we did miss the fly over and the first couple of innings because the traffic was horrific getting into the stadium. After my three day sabbatical I am back at work. I needed that time off!! I thought I was okay to go to work on Wednesday after our devastating news, but boy was I wrong. I got up as usual at 4:30 a.m. to get ready for work. I left my house at 5:30 a.m. (on time for once) and began my long trek to the wonderful city of El Monte. About half way there I broke down. I didn’t even realize my radio wasn’t on and I began to sob. It was one of those uncontrollable cries. I pretty much had a pity party for myself. I cried out “why me”, “why Kennedy” etc….. I feel sorry for poor Jen who got my 6:00 a.m. phone call looking for somebody to talk too – I didn’t know who else I could call that would actually be up (Thanks for listening Jen Smith). I told her how bad I felt and that I just didn’t know what I was to do. She talked to me for about 5 minutes and calmed me down. I got to work feeling Okay, I thought to myself that I would go in and get a couple things done seeing as it was quarter end and then go home. Well that didn’t happen – I walked through the door and straight into my bosses office. I explained to him what had happened at Kennedy’s appointment the prior day and then I lost it. I began sobbing uncontrollable again! I told him that I just didn’t want to be at work, my mind and heart where not there. I explained to him that all I wanted to do is be home with my baby. He gave me some GREAT words of advice and sent me on my way. I arrived at my moms at 7:30 a.m. to pick up Kennedy. She had a very surprised look on her face when I came knocking at her door. I told her that I wanted my baby!!! Of course those motherly questions came flying out her mouth, “why aren’t you at work”, “are you sure your okay”, “did you talk to your boss, you can’t afford to lose your job”. I replied yes to all and proceeded to walk into her bedroom swoop Kennedy out of her bed and put her in my car. We arrived home and got into bed – we laid there all day. She mainly slept and I talked and cried to her. I told her everything that was happening to her and how I felt about it all. She is the best listener. When I couldn’t cry any more I finally passed out. Boy, I wish I was in bed with her right now. It was great!!!! So.....I was trying to get this done last night but I just could not bring myself to sit down and face the facts. Kennedy's MRI results came back and they were devastating. We were told that my favorite person in the entire world has a Neurodegenerative Disease. Dr. Michelson showed my mom and I images of Kennedy's MRI so we could have a visual aid. The pictures he revealed left us speechless - Kennedy's brain was not growing and her myelin (white matter) was disappearing. At this point she almost has no more myelin left. The pictures showed a lot of spinal fluid in her brain. Meaning that as her head continues to grow her brain is not and spinal fluid is filling up the empty space. In addition, some other parts of Kennedy's brain (the basil ganglia & thalamus, which are two important structures) were showing signs of atrophy or shrinking. In addition, Dr. Michelson showed us that Kennedy's Cerebellum has not continued to shrink, however, he did show us how significantly small it is. It is about 1/6th the size it should be. We were told that Kennedy could have one of any 10 very rare genetic diseases. Dr. Michelson said that he thought it was a Luekodystrophy - WHAT, that word again. I thought we already traveled down this road and closed that door - apparently not. I explained to Dr. Michelson that Kennedy was already tested for three different kinds of Luekodystrophies (Metachromatic, Adrenal, & Krabbes) and they all came back negative. Dr. Michelson left us in the room while he went and dug through Kennedy's extensive medical file. After about fifteen minutes Dr. Michelson was back and asked me if we ever were tested for "X" disease (can't remember name) I told him no. He proceeded to tell us that Kennedy was never actually tested for Krabbes Disease. Loma Linda filled out the lab slip wrong and the blood was tested for the wrong disease - not Krabbes. Dr. Michelson said that it all made sense. He was pretty sure sounding about Kennedy having Krabbes Disease. He said her MRI/MRS images resemble somebody who has a luekodystrophy. In addition, the EMG she had done @ Loma Linda also showed that she had Peripheral Nervemyopathy which also is a syptom/sign of having a Leukodystrophy. We were sent over to the lab to get blood drawn for a test which I already thought was done and produced a negative result. I wish I could go back and make yesterday disappear! I wish I had a time machine! I knew Kennedy was sick but I guess I just hoped she would live on forever with us and we would adjust our lives to meet her handicap. We would always have a "special" family but I always thought she would be a part of it. I never in my wildest dreams thought I would be sitting in a doctors office being told my child has a terminal illness. 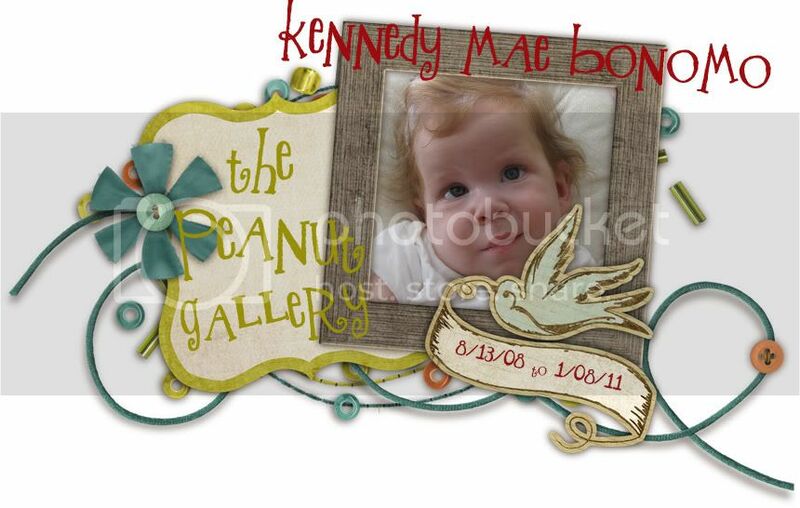 I am so sad that Kennedy will be taken from me by a disease - way before her time. It saddens me that I will never get to hear her say my name or watch her take her first steps. I don't know what I am supposed to do with out her. Now we wait and see (three weeks to be exact).....See what God has in store for my darling Kennedy.